5 Bedroom Terraced House For Sale in Sheffield for Guide Price £185,000. 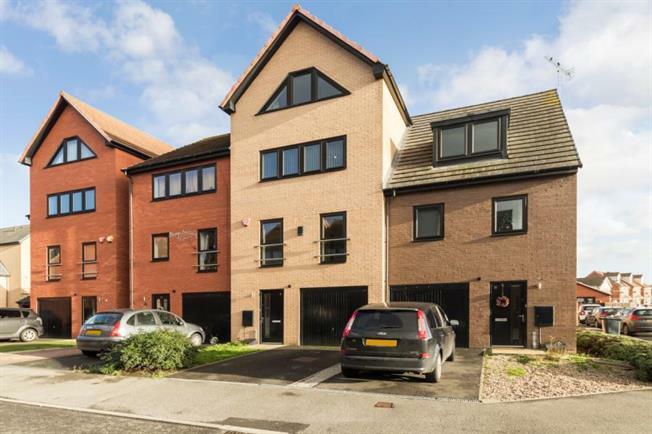 Situated in the centre of this modern sought after development viewing is a must. Of interest to a varied purchaser this versatile family home is offered for sale with no chain involved. Having five bedrooms and a study over four floors this spacious property gives access to local amenities and commuter links. In brief comprising of spacious entrance hall with stairs that rise to all floors and courtesy door to the garage. WC having a white two piece suite. Dining kitchen having a range of fitted wall and base units finished in high gloss aubergine and mocha effect with French doors opening to rear garden. First floor landing having rear facing lounge. Family bathroom with a white three piece suite, bedroom four and a study. Second floor landing having bedroom five, bedroom two and three have a jack and Jill en suite with a white three piece suite. Third floor landing is the master suite, the feature to the room is the front facing half eyebrow triangular window, there are two further rear facing windows to the dressing area, en suite having a white three piece suite. Outside to the front of the property is a drive leading to the integral garage and to the rear is an enclosed garden mainly laid to lawn.